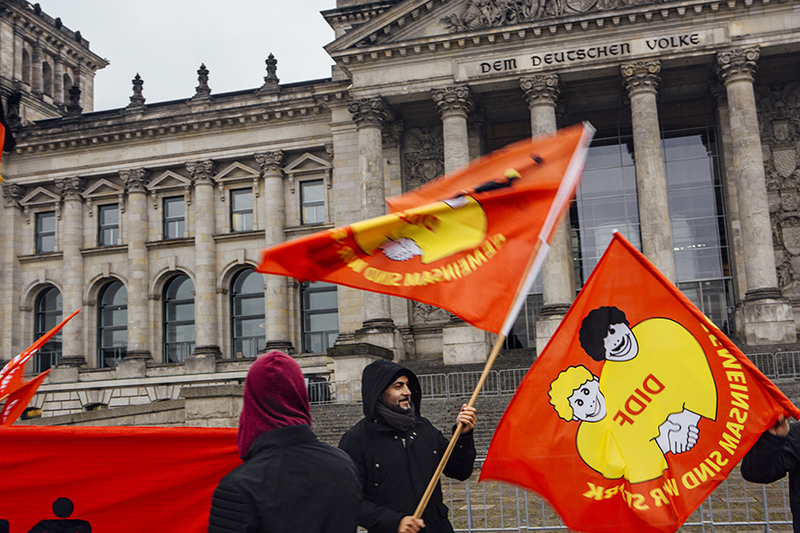 A small rally attended by leftist parties, anti-racist youths and Turkish-German unionists outside of the Reichstag parliament building denounces the newly restrictive “Asylbeschleunigungsgesetz” (Asylum Acceleration Law) that was passed that day. Taking effect on November 1st, 2015, the law calls for increasing the mandatory length of a refugee’s stay in an initial intake center to 6 months, while lengthening the work ban period and making access to higher education and job training more restrictive for young refugees who are granted a temporary stay of deportation, or Duldung – developments that will make integration a more difficult and lengthy process for new arrivals. The dedication Dem deutschen Volke – To the German People – is inscribed on the Reichtag’s frieze, and many of the fears and trepidation expressed by Germans who hope to clamp down on the flow of refugees to the country are going beyond economic concerns to touch on a longstanding debate over whether Germany is becoming a country that welcomes immigration and diversity.